Considering the magnitude of the problem of arsenic contamination of ground water, particularly in South Asia and more importantly the fact that, nearly all household and community scale solutions deployed have so far failed as they were not maintained, repaired, or affordable, a research team led by Prof. Ashok Gadgil at Lawrence Berkeley National Laboratory (LBNL)/University of California Berkeley (UCB) has developed and patented Electrochemical Arsenic Remediation (ECAR) to efficiently reduce high levels of arsenic in groundwater below the WHO maximum limit (MCL) of 10 ppb at extremely low cost. In all arsenic remediation systems, sludge is a by-product of the process, which contains high levels of arsenic adsorbed on iron precipitates. On the basis of detailed characterization of the arsenic-laden sludge in terms of physical and chemical parameters, such as testing for any toxic leachate, a safe and sustainable disposal method needs to be explored to provide a full solution to the arsenic remediation problem. 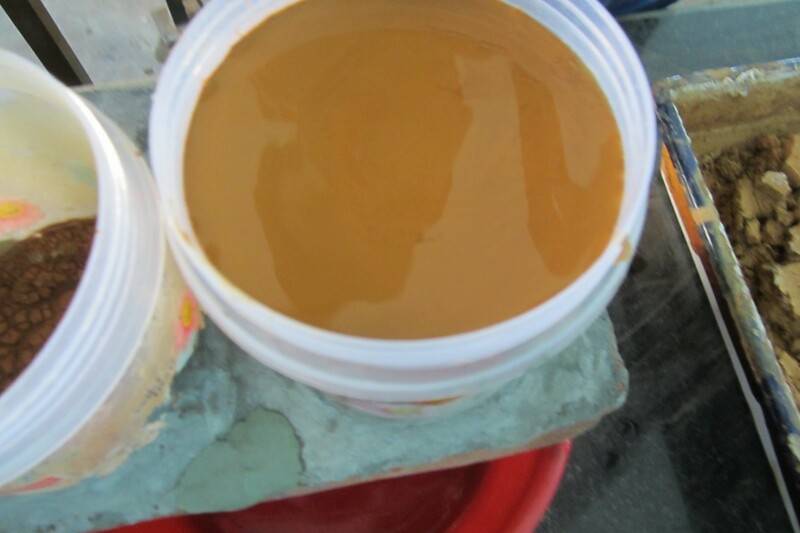 The team, based at Jadavpur University, will explore a safe and sustainable disposal method for the arsenic-laden sludge. We will embed arsenic bearing ECAR sludge in variable proportions (from 1% to the point of substantial deterioration of respective strength and other properties) in concrete, sand-cement mortar, brick and rigid pavement followed by measurement of arsenic and other toxic constituents (if any) in the leachate generated from the ECAR sludge embedded concrete, sand-cement mortar, brick and rigid pavement, both over a short and long term time span. The full solution of the problem will be achieved through the development of a socially acceptable sludge management plan with active participation of local stakeholders. 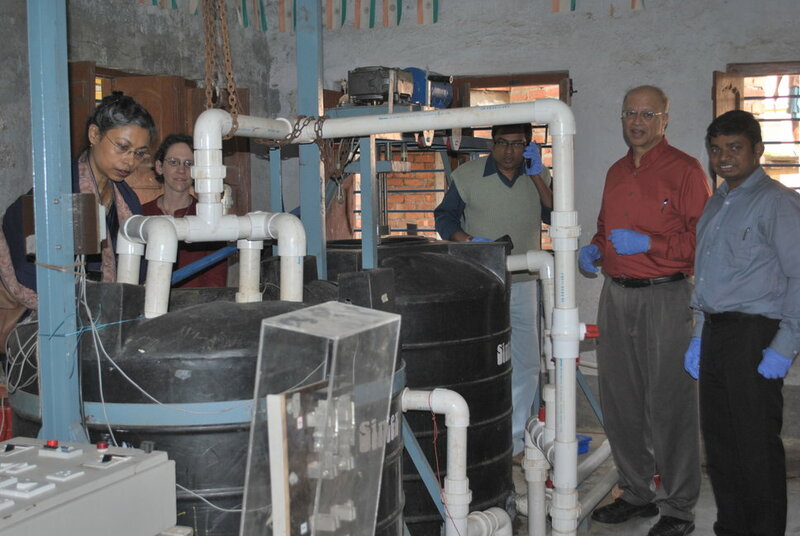 Field trials of the Electrochemical Arsenic Remediation (ECAR) 600L pilot plant were conducted successfully in a multi-month operation at Dhapdhapi High School, a rural school near Kolkata, India. In the field trials, the research team demonstrated that ECAR produced treated water with an arsenic concentration less than 5 parts per billion (ppb) consistently, which is well below the WHO standard of 10 ppb. The ECAR 2000L pilot plant with a throughput capacity of 10,000 liters per day was commissioned at the same school in August 2015, and since July 2015, water testing reports from third party national labs in India show that ECAR treated water is in compliance with Indian drinking water standards. The 2000L plant has been operating 5 hours per day, 5 days each week with 70% up-time, and since September 19, 2016, the plant has provided arsenic-safe water to the school community of nearly 3,000 people free of cost.